Phnom Krom (Khmer: ប្រាសាទភ្នំក្រោម) is a 140 m high hill close to Siem Reap, Cambodia. 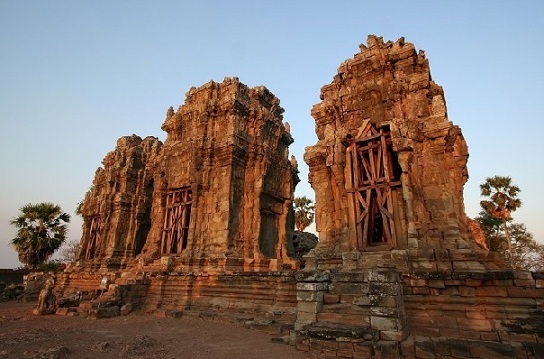 Phnom Krom is located to 12 kilometers southwest of Siem Reap town. Phnom Krom hill is very rocky; local legend has it that the rocks were exposed by Shri Hanuman during a hunt for medicine in the Ramayana. The area beyond the temple’s west gate affords a spectacular view of the Tonle Sap lake. There is an Angkorian temple on top of the hill. It is a Hindu shrine dedicated to Shiva, Vishnu and Brahma. The temple in was built at the end of the 9th century, during the reign of King Yasovarman (889 A.D.-910 A.D.). Oriented toward the east, the hilltop temple is enclosed by a wall built of laterite blocks. Along the walls' top runs a cornice. Gates bisect the walls at each of the four cardinal directions. Just inside the east gate are four small buildings arrayed in a north-south row, possibly formerly used as crematoria. Inside the walls on the north and south sides are three halls, now collapsed. The temple’s focus is three towers, also in a row running north to south. They sit atop a platform reached by staircases of seven steps. The southern tower is dedicated to Brahma, the central to Shiva, the northern to Vishnu. They are built of sandstone; much of their carving and detail has been lost to erosion. Phnom Krom is the southernmost of three hilltop temples built in the Angkor region during the reign of Yasovarman. The other two are Phnom Bakheng and Phnom Bok. Phnom Krom was at the southern end of the Phnom Krom railway, a narrow-gauge French colonial railway that was most likely constructed to take stone quarried on the now defunct quarries on Phnom Krom to Siem Reap.